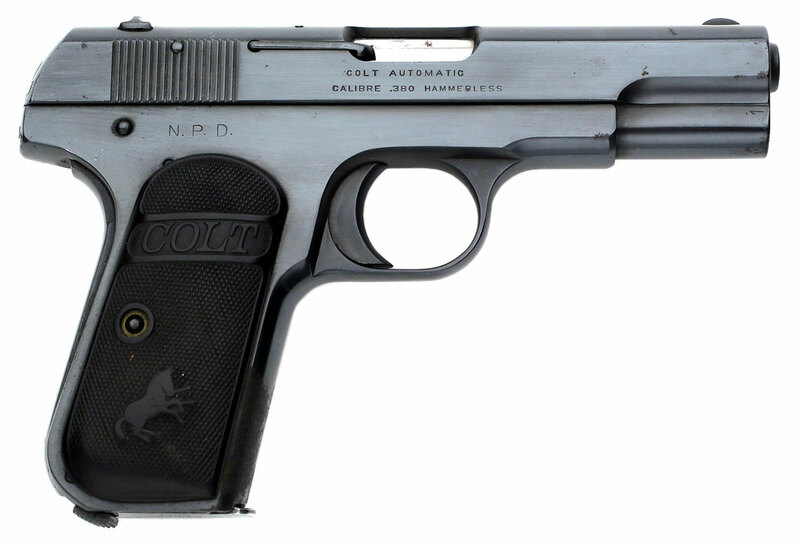 Colt 1908 Pocket Hammerless .380 ACP serial number 27946 - The right side of frame is marked "N.P.D." for the Northampton, Massachusetts Police Department. This pistol has been reblued at some point in the past. It was purchased in 1941 by Mr. Ernest Drexel directly from Chief George J. Bernier of the Northampton, Massachusetts PD on December 16, 1941. 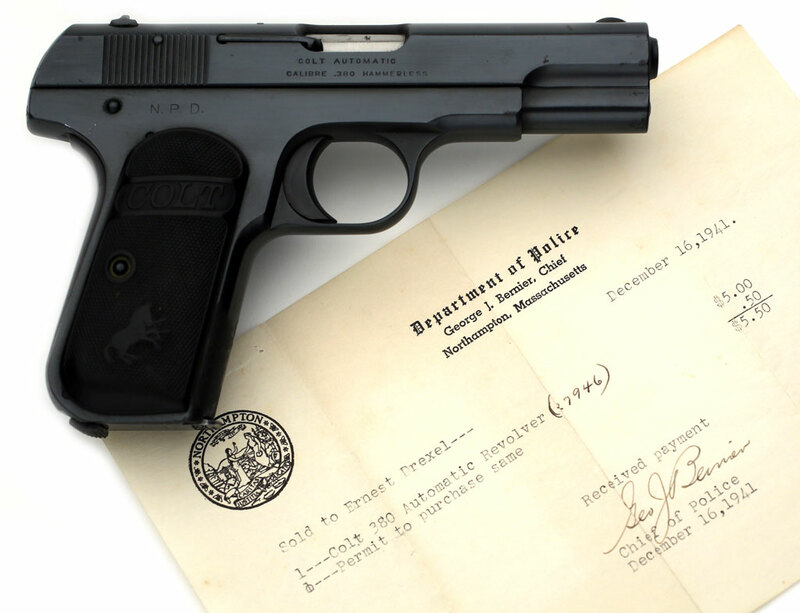 Accompanying this pistol is the original receipt (note the reference to the "Colt .380 Automatic Revolver") documenting the sale. 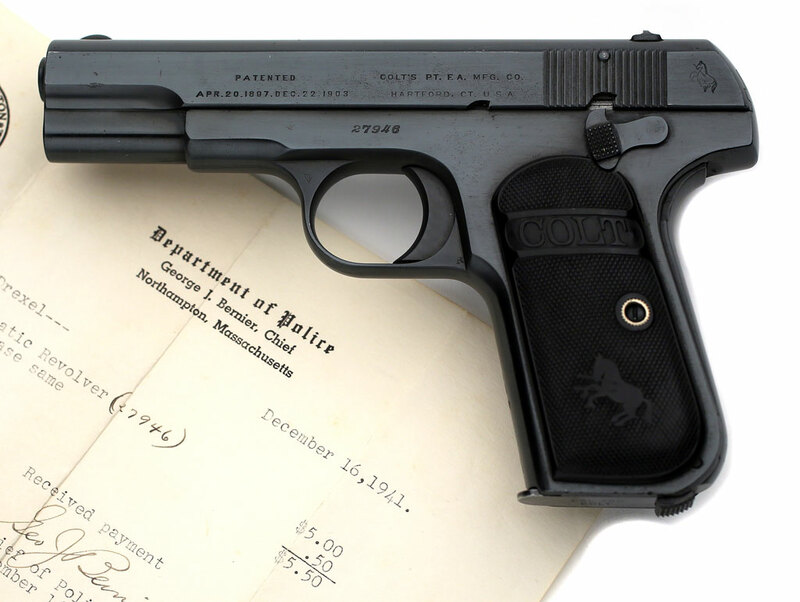 Colt 1908 Pocket Hammerless .380 ACP serial number 27946 - There were a total of 19 pistols in this contract, ranging from serial number 26014 to 55483 marked on the fame or grip safety shipped between March 27, 1916 and December 23, 1921. The first 14 pistols were Selected & Targeted and all roll marked on the right side of the frame. Colt Model 1908 Pocket Hammerless Pocket Automatic serial number 27946 - Factory letter confirms features and marking and indicates that the pistol was shipped to the Police Department, Northampton, Massachusetts, Attn: George W. Gilbert, Chief of Police, March 27, 1916, Colt Factory Order: #46, number of same type guns in shipment: 14. Original Colt Special Order Record for Colt Factory Order #46, dated March 25, 1916, showing 14 guns in shipment. 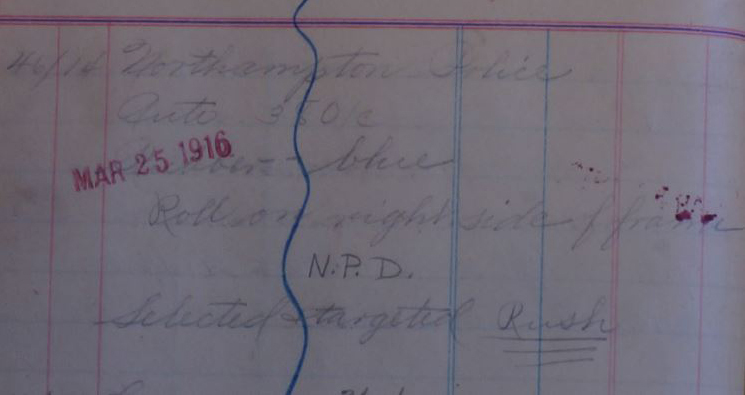 It's interesting to note that while not mentioned in the letter, these pistols were "selected & targeted" and this was a "Rush" order. Colt 1908 Pocket Hammerless .380 ACP serial number 27946 - right side showing N.P.D. factory roll mark.